Liven up the landscape with precision crafted, all-steel backless park benches from the Augusta Collection. The modern stylings of this one-piece bench is showcased through a laser cut frame crafted with sleek, sweeping legs and a slim profile bench seat. 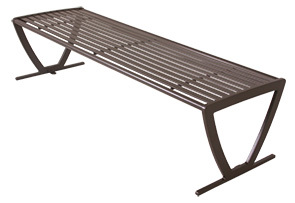 Utilizing a high-quality all-steel construction and ultra-resilient powder-coat finish, the Augusta Collection backless benches are upscale, durable and ready to provide long lasting performance in indoor or outdoor applications. Built-in tabbed footings maximize placement applications, accommodating both surface mount installation and portable capabilities.